In Brisbane, recycling for most people consists of splitting their daily household rubbish into recyclable, and non-recyclable items. Rubbish goes in the black bin, and recyclable items go into the bin with the yellow lid. Once a week (if your lucky) a truck comes past, and picks up the rubbish. That’s it really, nothing much else to think about! In Germany things are a whole lot different! Recycling here is huge, and is something that everyone does. After a while it becomes second nature, and you don’t even need to think about it. At first I was a little stunned with the amount you have to learn, but now I am like everyone else, doing the right thing for the environment. In Australia, when you go shop and buy a bottle of coke, water, juice, or any other favourite drink, you drink it, then chuck the bottle in the bin. That’s what I use to do. Here when you buy a bottle of drink from a shop, you keep the bottle, and return it at a later time. Why? Every bottle (well almost every bottle), has a surcharged place on it at the cash register before it leaves the shop. The surcharge varies depending on the bottle, what it is made of, and who it is made by. Coke bottles have a charge of 15c added. A mineral water bottle made of glass might carry a 75c charge. Thinking in terms of AUD and the EURO that is too much to throw away each time you buy a drink! The same goes for a carton of beer. All 24 bottles of beer carry the surcharge, as does the carton (which here is more like a crate). When you return all bottles and the carton you are returned your deposit which can be up to 3 Euros. Most Super Markets have some method of bottle collection. In most cases it is an automatic system similar to this one. You rock up to the machine with your bottles in hand, you put them down the shoot, or on the conveyer belt (for entire cartons), and after you have finished, you press a button. 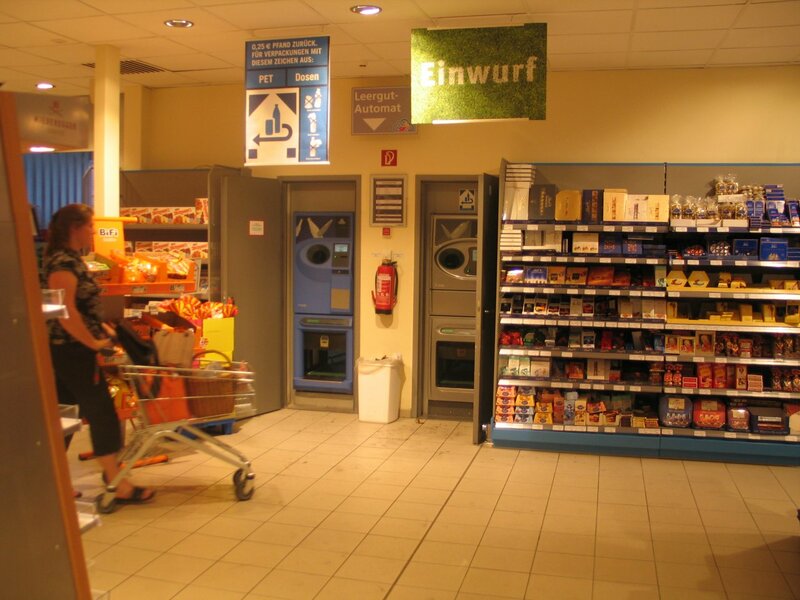 The machine then prints a ticket with a barcode, which you give to the cashier when you leave the store. You refund is then deducted from the sub-total of your shopping. Pretty simple and effective way to get people to recycle. Bottles that don’t carry a “Pfand”, such as wine bottles, glass jars, and any other glass materials are seperated by colour and placed in a huge umder ground bins similar to this one. A truck comes along every few days and empties the bin. Glass recycled. Around the house we have a number of different bins. We have a bin for food scapes (yes it smells sometimes), a bin for general waste, a bin for plastics, and a bin for paper products such as cereal boxes. It is all very complex! 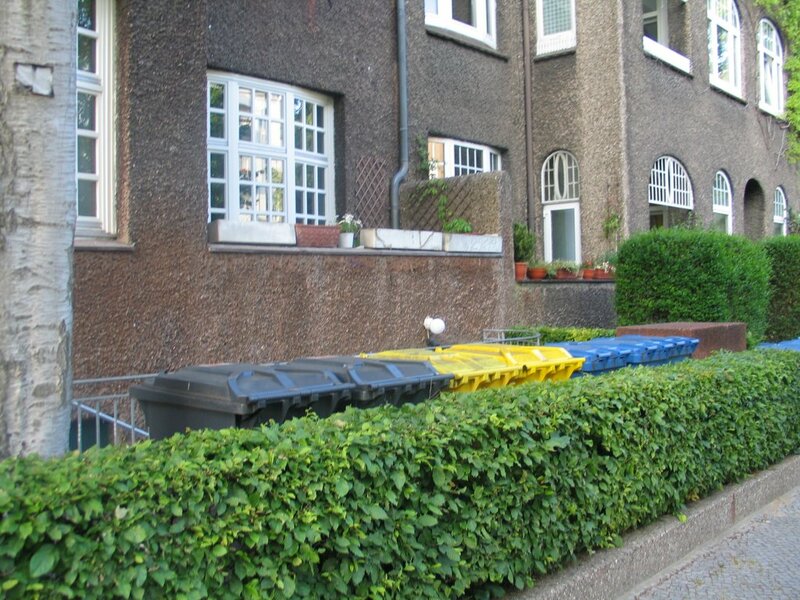 Outside most houses/apartments have a line of bins like this one. Each category of bin is colour coded so you can’t make a mistake. Brown bin (biological waste) – too small to see over the fence. This wastage is taken away a few times a week, and is made into compost! I have to say that all of this might sound a little more difficult than the Australian system, but from what I have read it is really working. Wastage here has been cut significantly, and the processes are really working. This surely must be good for the envirornment, and maybe one day a similar system might exist in OZ. that is some serious recycling.. sure beats brisbane’s two bins, one truck system – i have serious doubts about how much recycling is actually done from stuff people put in their recycling bins over here though – meanwhile, i wonder if we are still supposed to rinse out all the plastic bottles before putting them in the recycling bin seeing there is a water shortage? what would be considered more important – conserving water or reducing landfill??? I think in a country like Germany, with 82 million people, and only a relatively small amount of land, recycling is a key issue. I have to agree that it is doubtful that much recycling is done in Australia. Most recycling revolves around making money, rather than saving the planet. 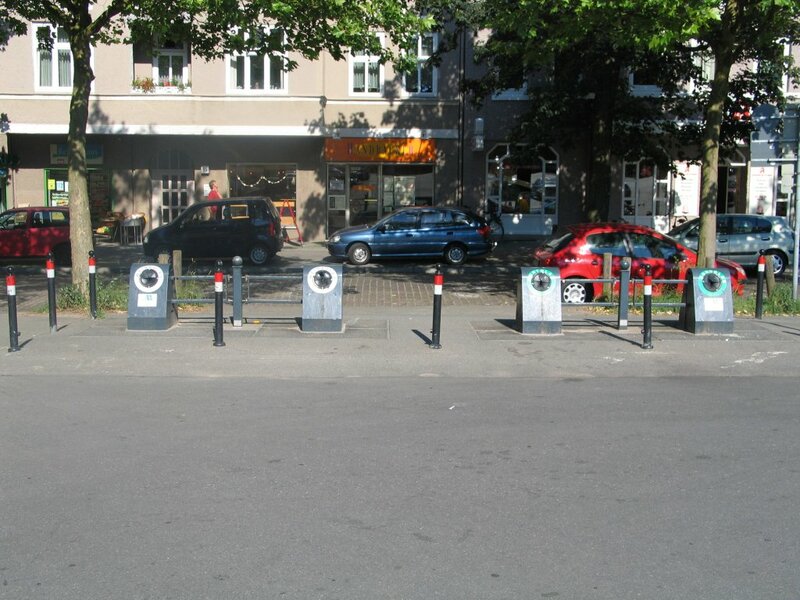 A great example of this is the Brisbane City Councils Waste Management Centres! $10 a pop to drop off some waste that in many cases will make someone money. When it comes to washing out the tins and glasses, it is still possible to recycle this water with a Grey Water system. Why not use this water to water the garden instead of using water from the tap? So much Grey water goes down the sink (literately) everyday. Dishwashers, Washing Machines, Showers, amongst others. If people get serious about recycling in Australia, I am sure there are numerous other ways to help the planet. Dann kippt Ihr mal weiterhin das Outback zu ;-).